Today, SOLDIER HOLLOW’s MADITA delivered a thrilling performance at Duesseldorf’s racetrack and surprised with a fantastic second place finish in the G3 Frühjahrs-Meile (€55,000). 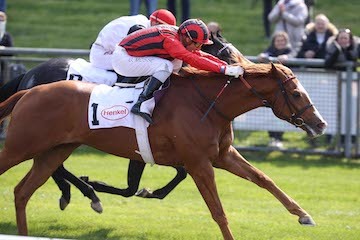 Racing in the silks of German Racing Club, the four-year-old entered the gates as the only female contender and biggest long shot, yet she put on quite a show with Bauyrzhan Murzabayev aboard. Coming off a trip midfield, MADITA shifted into a higher gear as the field entered the deep stretch and chased the odds-on favorite from the UK, multiple G1 winner Stormy Antarctic. In the end, trainer Sascha Smrczek’s protege was only a neck away from the winner, recording the biggest success in her career yet.